We know how it goes: every year you tell yourself you’re going to learn how to work on your own bike so you can stop paying labor rates, only to carry your bike in 6 months later when it’s time for a new chain. Well it’s time to commit, and Feedback has you covered with this Team Edition Tool Kit. 19 professional-quality tools all conveniently housed in a case that can hang from your work stand, what could be better than that? Everything you could need to get started on your own routine maintenance is here; derailleur adjustment? Check, grab the fixed 3-way and a Phillips-head screwdriver and get to work. Creaky, worn out bottom bracket? Grab your bottom bracket wrench, the matching adaptor, muster up some elbow grease, and you'll be rolling in no time. Pick up your Team Edition Tool Kit and get wrenching today. This kit is well-designed and reasonably complete. I've taken it to several races - the case is nicely hangs on a stand or lays open for easy access to tools. All the tools seem to be of good quality for the price. 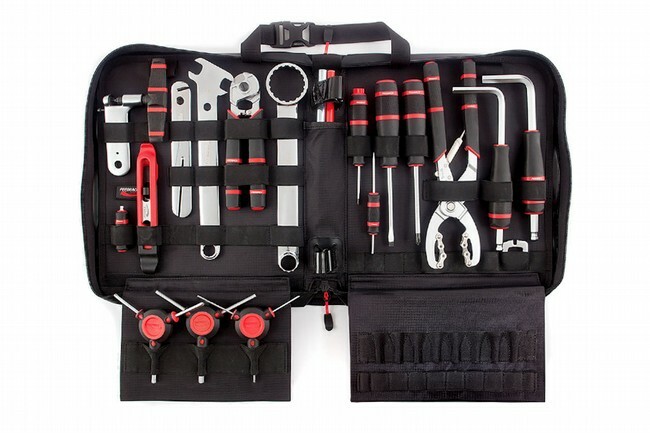 There isn't much space in the case for additional tools - I have some older bikes so I also bring along tools not included in thIs kit, such as a small set of open-end wrenches.